File this one under pop culture. 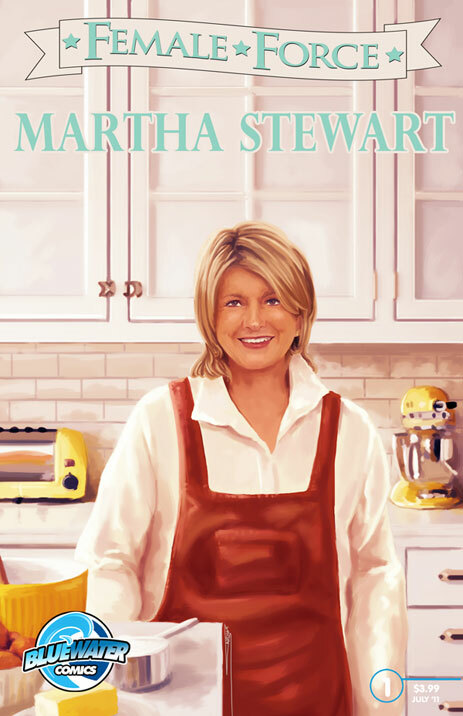 A colleague of mine recently informed me that there was a Martha Stewart comic book available. I assumed he was joking and abruptly chuckled. "No, really," he said with a serious stare, "there is." I looked it up and found that Martha is the latest leading character in an ongoing series of comics under the "Female Force" brand by Bluewater Productions. (This is not an MSLO release, folks. Let that be clear!) The series aims to highlight the lives of powerful, productive women - mostly American - through a fictional retelling of their life stories in comic-book format. Michelle Obama, Hilary Clinton, Anne Rice, Oprah Winfrey, Ellen DeGeneres, Barbara Walters, Madonna, Princess Diana and even Barbie have their own comics. You can view the series of comic books here. The comic will be available for purchase in July through the official Bluewater eBay site, for anyone who may be interested. I just found this comic book thing odd... I think it's a Martha Moment I'll pass on! You are both passing on this?! I am shocked!